This week I am sharing Nursery Rhymes that connect well with the themes of Easter. Yesterday I shared a Humpty Dumpty puppet craft and all of our favorite egg themed ideas. Today's lesson focuses on the religious meaning of Easter. We read "Hot Cross Buns" and many of our activities focused on the cross. If you teach in a christian school or homeschool, this is a great way to weave the meaning of Easter into your studies. If you teach in a public school, you can may have to skip the cross activity, but could still use the math activities with money and maybe even eat hot cross buns! After reading Hot Cross Buns we had to make Hot Cross Buns-- what else? I had never, ever eaten hot cross buns. (I know, I had a deprived childhood, I guess). When searching for the perfect HCB recipe, I found this post by the Pioneer woman. 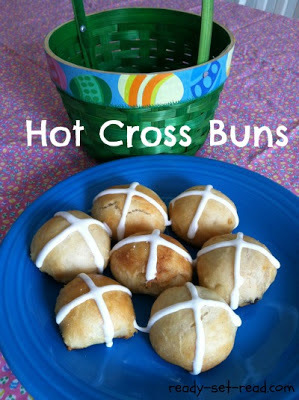 It gives a great recipe for Hot Cross Buns as well as some of the history of the buns. 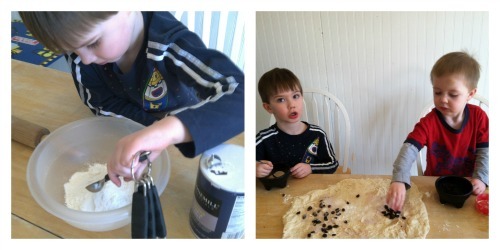 I did a lot of the preliminary steps alone and then let the boys help with the final steps of the dough, spreading it out, and shaping the rolls. When you allow preschool boys to help you bake, the results are not as beautiful as the rolls the Pioneer Woman would make. They still taste great, though. The boys absolutely loved eating their own hot cross buns. 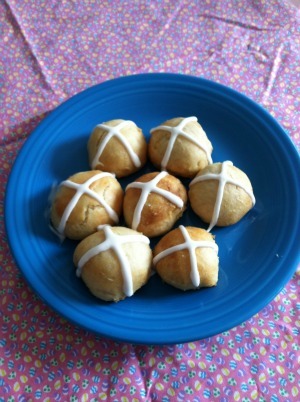 If you are looking for an easier recipe with preschoolers, you could also make resurrection rolls. It would still fit nicely with the theme of Easter and Nursery Rhymes, I think. You could even pipe the icing crosses on them at the end. 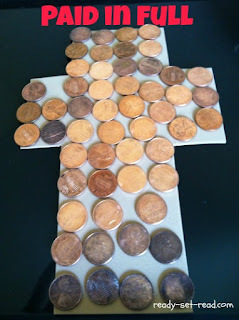 We not only focused on the hot cross buns, we also talked about pennies-- and other coins. Logan sorted pennies, nickles, dimes, and quarters. 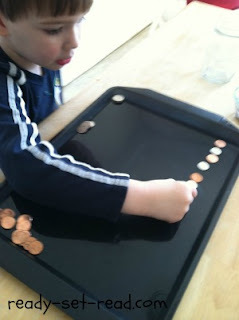 He made patterns with his coins. 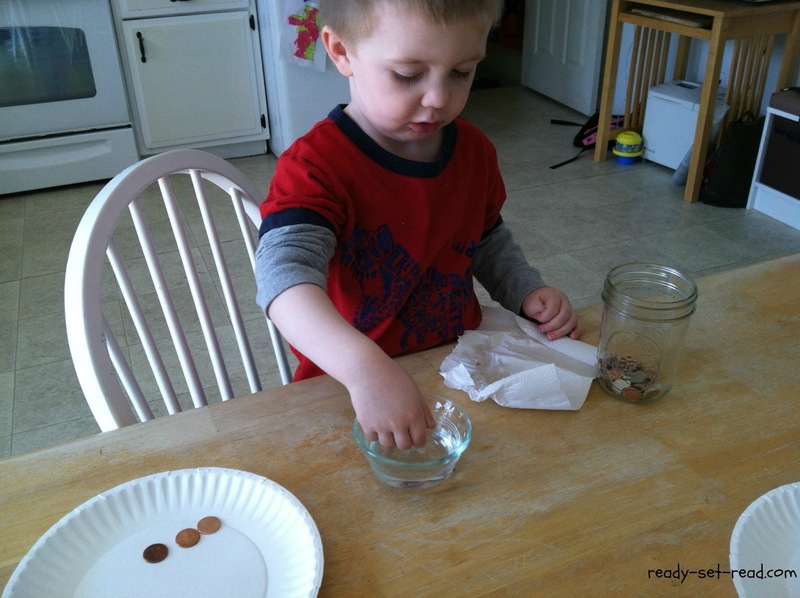 Both boys cleaned pennies with vinegar and vinegar with baking soda. We weren't sure how to clean our pennies but this post from Royal Baloo is very helpful if you are wondering how to clean a penny. 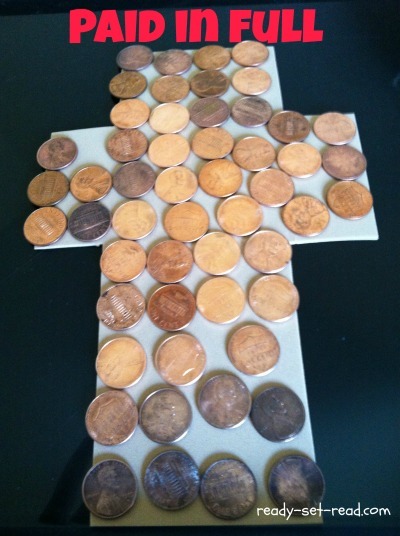 We used our clean pennies to make a penny cross. (Mostly clean pennies, I should say). I based this craft off one I found on Pinterest last year. We also talked about the meaning of the coins on the cross. I've heard some parents say they are unsure about how to introduce Jesus' death on the cross. Even though we are telling kids that Jesus rose from the dead, it seems harsh to tell them that Jesus had to die. For me, this craft helped me to introduce that concept in a gentle way. I explained to Logan that Jesus died so that we don't have to die. I told him that we owed something and Jesus was able to pay it. Tyson wasn't eager to make a penny cross, but he explored while Logan was working on his cross. I was so surprised to see what he made. 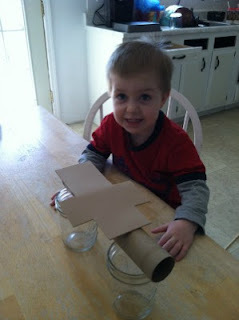 He proudly showed off his work and said, "Look, momma, a bridge!" Of course, I used this teachable moment as an illustration for the boys. "People are separated from God," I said, "because God is perfect and people are not. No matter how hard we try, we can't make it to God. But God sent Jesus to die on the cross. Jesus is our bridge to get us to God." It's a simple illustration that I've heard many times, but it was a sweet time of sharing with my boys. They aren't old enough to understand fully but the seeds are there for them. Come back tomorrow, we'll be talking about Easter Baskets and nursery rhymes! Don't forget, you can find many nursery rhyme ideas by following my Nursery Rhyme Pinterest board. I think these activities are great for teaching the significance of Easter. Thanks for sharing them. I found you through the We Teach Weekly Blogger Share. I'll gladly send you over some cooking supplies as a thank you!